What is it about Zucchini that we all seem to gravitate to? Whether is be the delicious Zucchini “fries” from one of my favorite restaurants, Stella Luna, or whether they are wrapped around mozzarella and baked in a tomato sauce, or made into fritters or “pasta” it’s one of my all time most yummy and delicious choices for a side or a main in a meal! 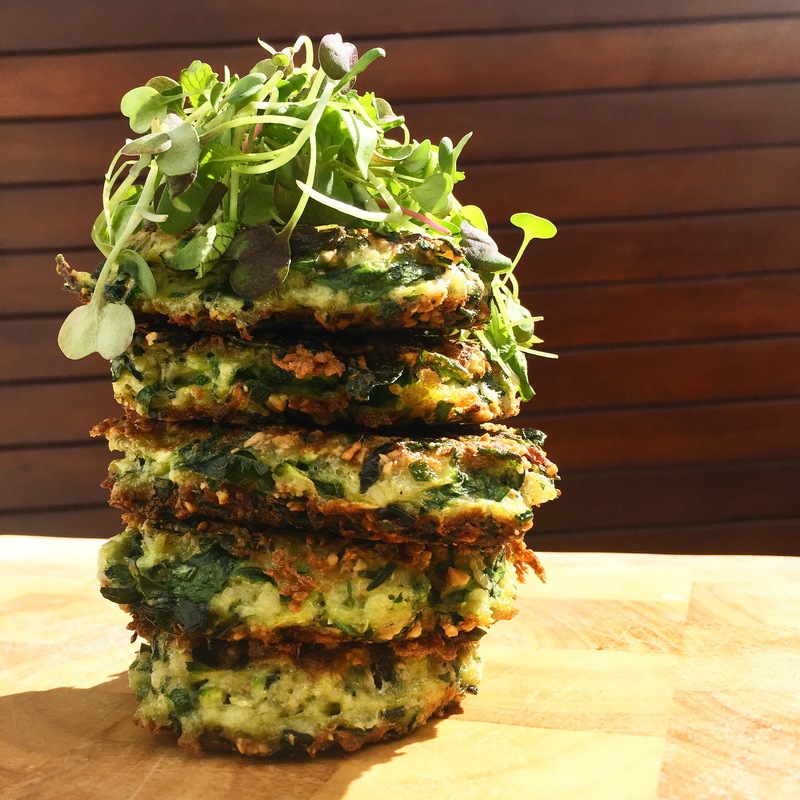 Here’s a quick recipe adapted from two others and mashed together, to bring you an almost frittata, crispy, fritter type cake. Perfect for lunch, brunch or a quick snack (make them, keep them in the fridge and eat them cold). Place the zucchini in a bowl and sprinkle with salt. Leave to stand for about 10 minutes. The salt helps draw out moisture. In a clean dish towel, squeeze out the zucchini and get it as dry as possible. In a mixing bowl, combine all the remaining ingredients, besides the coconut oil, and add the zucchini. Mix well. Add the coconut oil to a pan, and bring to a medium heat on the stove top. Add large spoonfuls of the fritter mixture to the heated oil, and fry until golden brown on each side – flipping carefully. Serve these with fresh Neapolitan sauce or slices of avocado and a squeeze of fresh lemon juice, or a fresh rocket and cucumber salad. Keep what you serve them with simple as these fritters don’t need much to make them shine! I love that you added basil!